2017 is over and we’re just past the halfway point in the federal Liberal’s majority mandate. With this in mind we thought it timely to reach out to Canadians at year’s end and ask them to take stock of the Trudeau Government’s performance. What follows is our #govtscorecard for 2017. Overall, the results suggest that the Trudeau Government is holding its own – despite receiving tepid ratings in several key areas, such as health care, the environment, the economy and trade, they are scoring well on jobs, securing Canada’s place in the world, indigenous relations and, of course, the popularity of the Prime Minister. Our results suggest that if Canadians went to the polls just before Christmas the Liberals would keep their majority status, findings that have been reinforced by recent polling data released into the public domain in the last few weeks. This despite all of the issues and questions around ethics that were playing out at the end of the year. Our analysis also suggests continued polarization between Conservative supporters and those of the other two main parties (on everything), which is risky for the Liberals given the potential for vote splitting on the left, but given the uncertain future of the NDP in Quebec, perhaps not as threatening as it could be. What is also unknown at this what the Conservative ceiling is and much. The arrival of Andrew Scheer on the scene as leader may have helped the Conservatives’ popularity, but the presence of Jagmeet Singh at the helm of the NDP has yet to have an impact. The NDP should be particularly troubled by their numbers in Quebec, the key to their surge under Jack Layton (see below for federal vote intention numbers from our December survey, isolated to the province of Quebec). Perhaps as a result of this the Bloc Quebecois seems to have had some life breathed into their party. Or perhaps it’s because of their new leader Martine Ouellet, who as a staunch separatist provides a safe place for sovereigntists, and soft- sovereigntists, to express themselves politically at the federal level without the risk of doing so at the provincial level. Any way you slice it, Quebec is a going to be hotly contested in the next election and the federal Liberals have a lot of opportunity. Justin Trudeau’s personal performance ratings are good, almost 4 in 10 Canadians rate his performance as ‘good’ or ‘excellent’ (37%), and those numbers go up dramatically for Liberal voters (78%, +41). Compared to his two main opponents, Scheer at 21% and Singh at 18%, the Prime Minister is in an enviable position. Interestingly the opposition leaders’ performance numbers by their own parties are less intense than the Liberals, where only about half of conservatives rate their leader as ‘good’ or ‘excellent’ (54%) and an equal number in the NDP for Singh (51%), no doubt a result of their relative newbie-status as leaders. 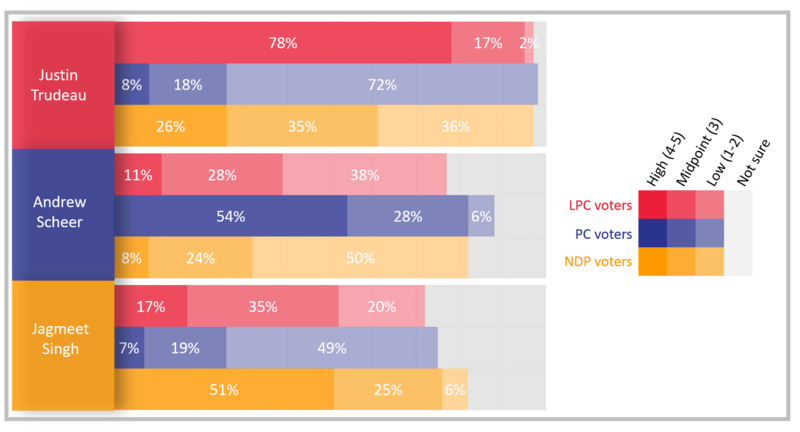 It is also interesting that 26% of NDP voters give Trudeau a high performance rating, whereas Singh only gets 17% from Liberal voters suggesting further room for the Liberals to grow their vote during an election. Scheer’s performance is in the single digits with both Liberal and NDP voters and vice versa with respect to Trudeau and Singh’s ratings among CPC supporters, further demonstrating the deep right/left divide. With that political landscape in mind, let’s broaden our scope to the federal government’s performance generally, as well as in key policy areas. What the findings reveal is a Canada divided. In the eyes of Liberal supporters, and a sizable number of NDP voters, the federal government’s performance has been good. For example, we find that only about one in three Canadians think the federal government is on the “right track”, and in fact, a plurality of 40% hold the opposite view. However, among Liberal voters, only 4% view the government heading down the wrong track. A modest 42% of NDP supporters feel this way, while a whopping 76% of Conservative voters think the federal government is on the wrong track. Our pre-holiday survey also asked Canadians to give the federal government a pass or fail grade for their performance in 2017 across a series of areas. As shown in the chart below, the only area where the government received a passing grade from a majority of Canadians pertains to Canada’s status in the world. And, the only other area where the federal government receives a significantly higher proportion of passes than fails (though not from a majority) is on jobs – a critical achievement for this government. In most subjects, the government is either barely passing (e.g., the environment, trade) or barely failing (e.g., guns laws, defense/security). Included among the latter is the high-profile issue of cannabis, where only 41% pass the federal government compared to 44% who fail it. Health care is the only area where the proportion of fails significantly outweigh the passes. We looked at the pass/fail results in aggregate (i.e., the average of all 12 areas) and according to voting intention. The pass mark accorded by Liberal supporters is 63%, compared to an average mark of 26% pass from Conservative voters, and 39% pass among NDP voters. The results presented in the above chart also point to two areas where the federal government may want to increase its public engagement and communications efforts: the innovation file and their plans related to guns. For both, about a third of respondents told us that they haven’t heard enough about the government’s efforts to grade them. Given the timely, and much discussed, issue of trade we dug a little deeper on international trade negotiations between Canada, the US and Mexico, as well as with China. 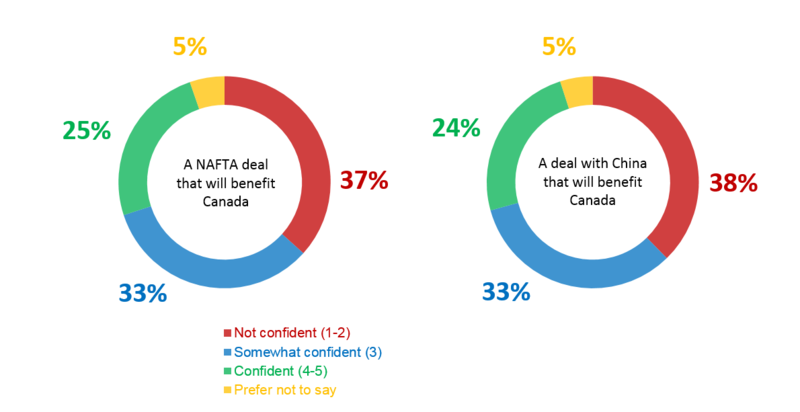 Overall, only a quarter of Canadians are confident that the Trudeau Government will reach a deal that will benefit Canada, whether it’s with the US and Mexico, or China. Despite the existence of NAFTA and the political, cultural and economic proximity of the US and Mexico to Canada, Canadians are no more sanguine about the possibility of a beneficial deal with these two countries, than they are with China. Taken together, our research paints a picture of the Liberals in fairly good shape heading into 2018. It also seems that Andrew Scheer is on solid footing with his base, but his growth potential might be limited, especially if the economy continues to grow and the job creation narrative continues to stick to the Liberals. It’s hard to imagine Scheer either taking to the left or dawning populist garb to woo the angry and alienated (the Conservatives have already tried that). The big question surrounds Jagmeet Singh and the NDP – can they convert undecided voters and Liberal supporters? Can they hold onto seats in Quebec, gain seats in other areas, or both? Will the left split, weakening the Liberals and lifting the other two parties? All good, and exciting, questions. Without a doubt 2018 will be an exciting year of positioning leading into election year 2019. Hill+Knowlton Strategies conducted an online survey of residents of Ontario between Dec 8-15 , 2017. In total n=817 members of the general public 18 years or older were surveyed. Final survey data were weighted based on Census figures according to region, age and gender in Ontario (associated margin of error for a probability sample of this size is +/- 3.4%, 19 times out of 20).